It seems everywhere I look there are blossoms, blossoms, blossoms. Spring is officially here, and with it, tons of flowers. While out for a nice walk, the tot and I couldn’t help stopping every few blocks to check out the colorful beauties, which reminded me of amazing Chinese blossom paintings. Full of bright pinks and reds, traditional blossom paintings are delicate and pretty and then lined with black lengths of tree. Blossom trees welcome spring in Asia and are also a large part of Chinese New Year celebrations as decorations. After we returned from out outing, I pulled out the tissue paper and glue. While I cut several circles of pink, red, and fuchsia tissue, I enlisted the tot to mix together equal parts glue and water in a small container. If your child is old enough to cut with scissors, she can be in charge of cutting tons of different sized tissue circles. Once there’s a nice pile of tissue circles get out a sheet of white paper and invite your child to sprinkle the tissue circles around the paper and then brush with the glue water. Encourage your child to overlap and layer the tissue as much – or as little – as she’d like. While the paper is still wet, offer your child a black marker and invite her to draw lines to represent trees and the branches of the trees. The marker washes in with the glue water and tissue, making the artwork dreamy and spring-like. Your child can even use a green marker to add the surrounding grass. 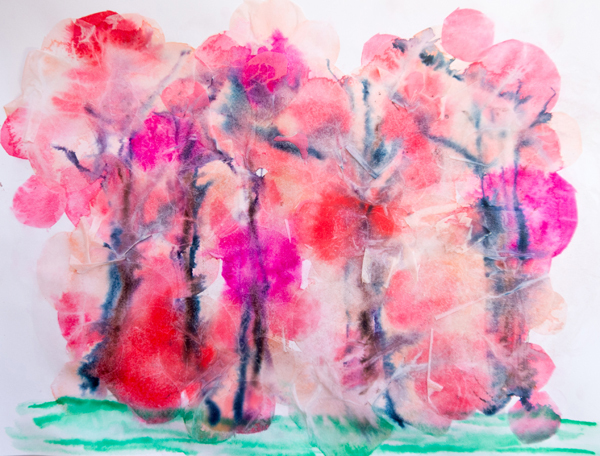 Don’t’ forget to find the perfect spot for displaying your child’s finished spring blossom artwork! So lovely…what a great idea…i wish we had blossoms at the moment! Thanks so much for sharing with the Kid’s Co-Op! How pretty! Happy you stopped by and shared with the Kid’s Co-Op!